What would you think if your best friend went on a date with the King of the Dark World; and, she did it just because she thought he was cute!? You'd think that she'd been duped, set up; and you might be right. The universe is a system of worlds chiefly represented by the Human World, The Dream World of Queen Valia, and the Dark World of King Rogles. The hideous Dark World of Rogles and his 5 Dark Lords is poised to beat all other worlds into submission. The universe is in danger of becoming completely Dark. They have already taken the force of Yang from Queen Valia, and have sealed it into a fantasm jewel. 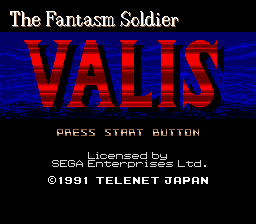 Now, the only one who can help is the one with a heart perfectly balanced with Yin and Yang, the one you control - Yuko, a student from the Human World, chosen to wield the sword of Valis against the encroaching Darkness. As she becomes the greatest warrior in the universe, she never suspects in her wildest thoughts that her greatest battle will not be against one of the five Dark Lords, but against the one she called her closest friend, the one she warned "don't go out with him, he's the Dark..." and before she could finish, her friend ran off... into Darkness. --From the Genesis Valis instruction manual.